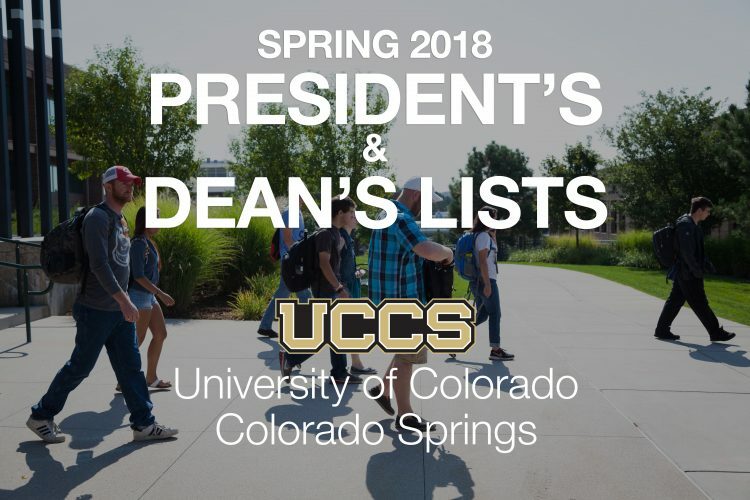 UCCS announced the names of 1,809 students who achieved academic success during the spring 2018 semester with President’s or Dean’s List honors. The honors are awarded to undergraduate students enrolled in at least 12 hours in four of the six colleges. For President’s List honors in the College of Business; College of Letters, Arts and Sciences; and School of Public Affairs; students needed to attain a perfect 4.00 grade point average during the semester. For the Dean’s List, students needed a GPA between 3.75 and 3.99. In the College of Engineering and Applied Science, the students with a 3.50 or greater earned President’s List accolades, while Dean’s List was presented to students with a GPA between 3.00 and 3.49. The College of Education and the Helen and Arthur E. Johnson Beth-El College of Nursing and Health Sciences do not compile President’s or Dean’s Lists.